this is the 20th night I’ve tried to suffocate this woman. Am I doing something wrong? Maybe I should try putting the pillow over her face. My cat used to do that when I’d let him in the bedroom. Funny cat. @Brushaway, your cat bites your eyelids while you sleep? Haha, doesn’t that hurt? This picture gets much better when you realize that the woman is dead. 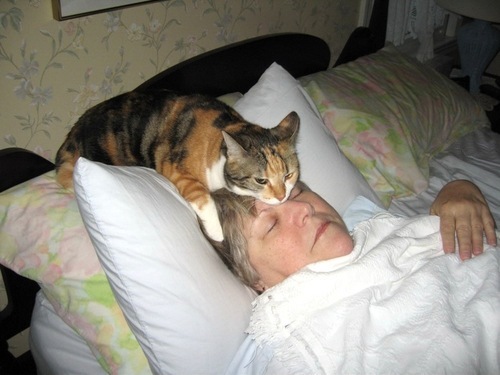 The carnivorous symbiotic parasite inhabiting this cat feasts on the woman’s cerebral fluids each night. The true reason those “cat ladies” are retarded.